NEW YORK (Reuters) - Wall Street rallied on Tuesday as investors were heartened by a tentative congressional spending deal to avoid another partial federal government shutdown and by optimism surrounding U.S.-China trade negotiations. President Donald Trump said he would be willing to let the March 1 tariff deadline slide as top U.S. officials arrived in Beijing for high-level talks later in the week to hammer out a solution to the trade dispute between the world's two largest economies. "It's a combination of hopes that (a) government shutdown is not going to happen and maybe the March 1 (tariff) deadline isn't so firm," said Stephen Massocca, senior vice president at Wedbush Securities in San Francisco. "People were concerned we were going to see a dramatic increase in tariffs, and those fears have been somewhat allayed." Tuesday's rally was broad-based. Of the 11 major sectors of the S&P 500, all but real estate closed in positive territory. Technology stocks provided the biggest boost to the S&P 500, and they also led the Nasdaq's advance. 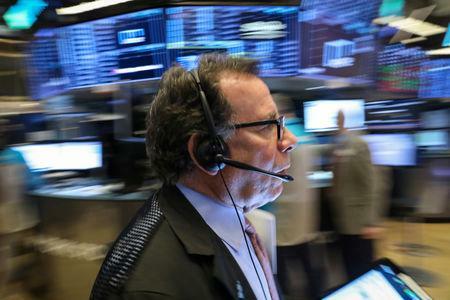 Tariff-sensitive industrials headed up the Dow's gain, led by 3M Co, Caterpillar Inc, United Technologies Corp and Boeing Co.
Electronic Arts Inc announced that its Apex Legends video game has signed up 25 million players in the week since its release, sending its stock up 5.2 percent. The video game maker's shares have soared by nearly 28 percent since the game's release. Under Armour Inc jumped 6.9 percent after the sportswear company beat analysts' profit forecasts for the holiday quarter. Volume on U.S. exchanges was 7.09 billion shares, compared with the 7.45 billion-share average over the last 20 trading days.